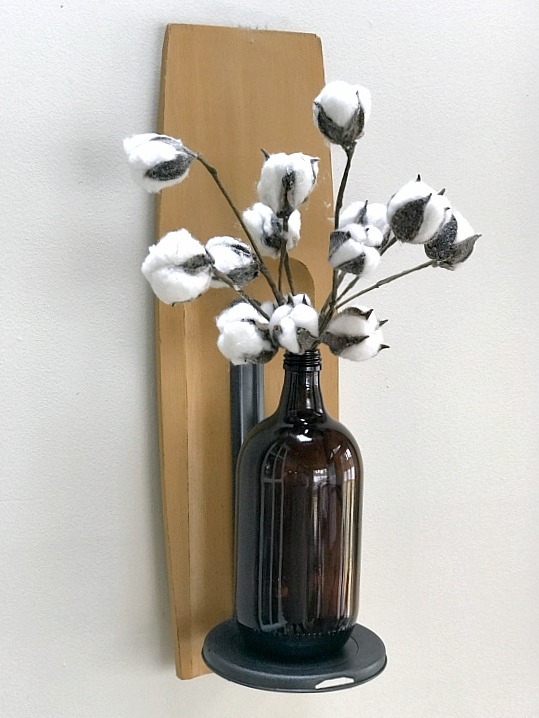 A cutting board and a vintage candle come together to create a pretty wall shelf for a recycled flower vase. The first thing I did for this project was to re-arrange a few of the original pieces. I glued the part that was the light reflector from the candle sconce onto the piece that held the glass globe to create a shelf. When you click on the bold Amazon affiliate links you will be taken to the products I use for this project. If you order it does not change the price or service at all. I will receive a small commission - but here is where you can order what I find success using at Homeroad! Next, I painted the piece with black hammered spray paint. Black hammered paint is the best thing to use when the piece you're painting has a lot of imperfections. The texture in the paint hides the flaws. 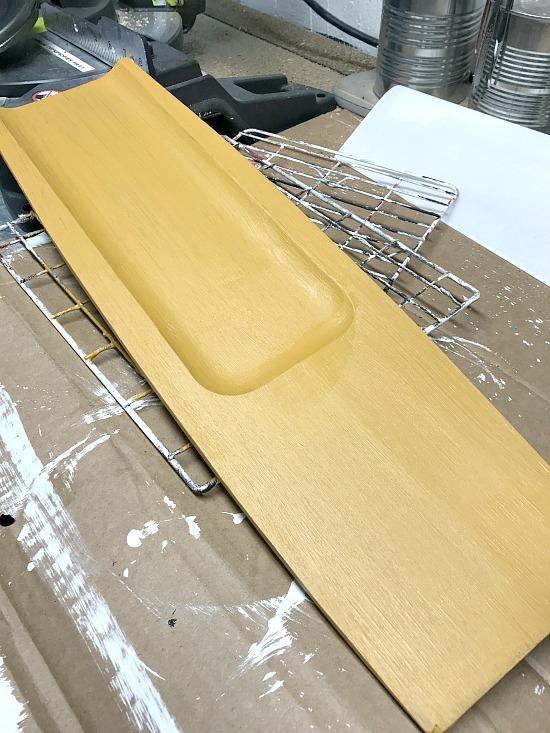 While I waited for the spray paint to dry, I painted the cutting board with Mustard by Fusion Mineral Paint. Here is where you can find a Fusion Mineral Paint store near you. I gave the cutting board two coats then lightly distressed the edges with sandpaper. 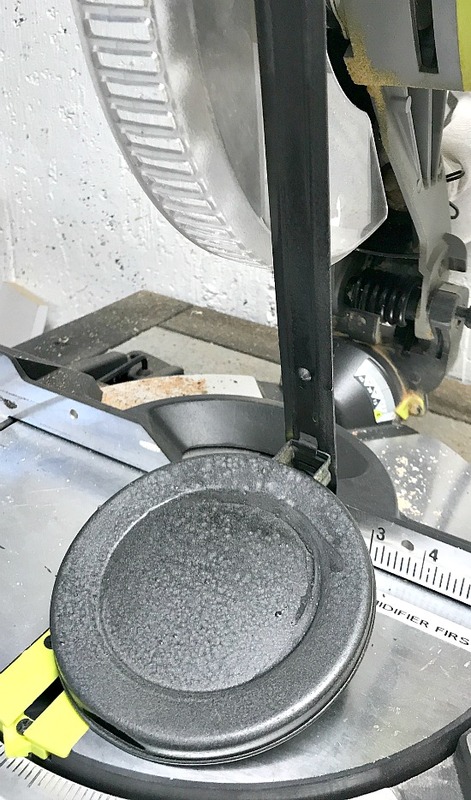 I attached the metal shelf I made from the lamp parts to the cutting board with screws. Lastly, I hung my new wall sconce shelf on the wall by attaching a D ring to the back of the cutting board. 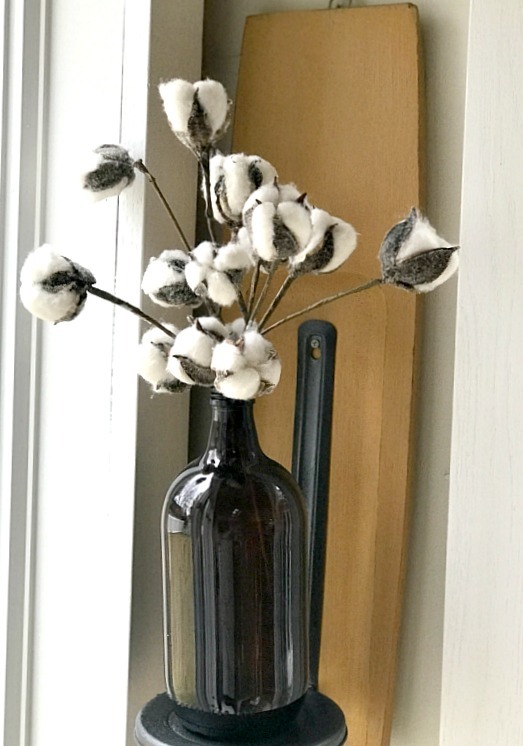 The brown recycled iced coffee bottle was the perfect vase to use for the cotton stems. I love how it is thin enough to hang in even the narrowest places in my home. My home has a lot of windows and the wall space is at a premium. Cutting boards from the thrift store come in all shapes and sizes. 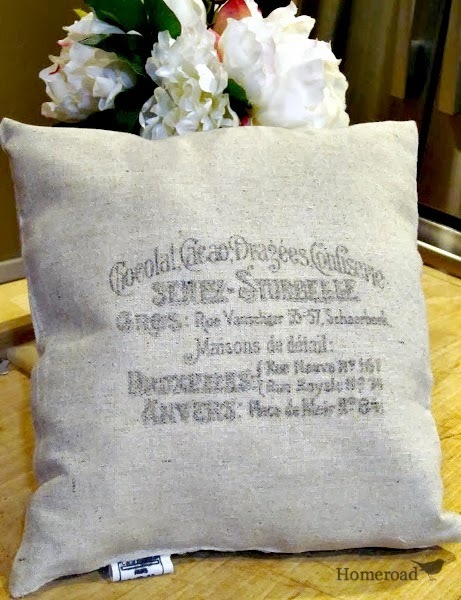 They are good for painting and repurposing and with a little imagination, you can create and recycle all in one step! Take a look at the project post I wrote about repurposed cutting boards --->> Ten Thrifted Cutting Board Ideas. 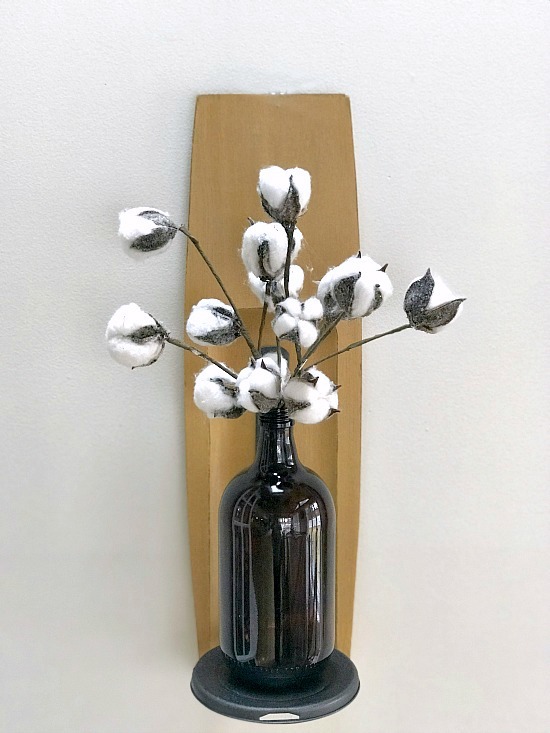 The shelf can hold any vase with flowers or just about anything tall you want to display. 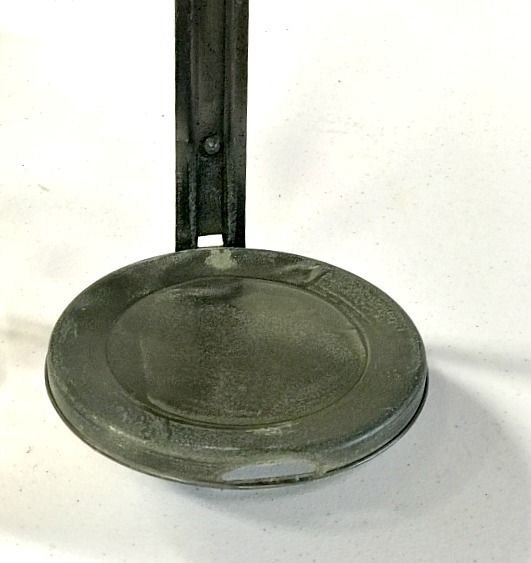 Wooden Candlestick Makeover I made that is another project perfect for narrow wall spaces. 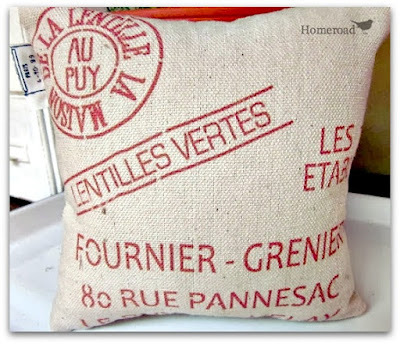 Please sign up for the Homeroad emails so my latest DIY project can be sent straight to you!